Tag Archive | "Cedar Auto Supply"
The building at 95 N. Main shortly before Cedar Auto Supply closed. 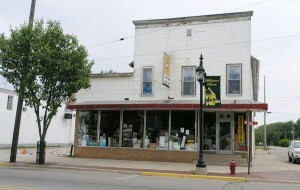 The third time was not the charm for the sale of city-owned property at the southwest corner of Maple and Main Streets. Liquor Hut, who owns the business just south of the vacant building at 95 N. Main, originally offered to buy the old building, formerly home of Cedar Auto Supply, and demolish it. Last year the business submitted a revised offer saying they would rehabilitate the building. Then, in mid-February, they changed their mind and asked to only buy the two vacant parcels, after they had the building inspected and said they were told that the entire second floor contained asbestos. City Manager Christine Burns took the offer to the City Council on March 8, but they were not receptive. Most council members agreed that selling off the two vacant lots left the building even less valuable than before, and that the property would be more marketable if the city demolished the building and sold the entire parcel together—four 66×132 lots. Burns estimated it would cost $8000 to $10,000 to tear it down. They already have $20,000 invested in the building, and estimate that they could probably get $30,000 out of the property if sold as one parcel, which would recoup their costs. They are not allowed to make a profit on the property, since they bought it from Kent County due to a tax foreclosure. Burns said that there is a fuel oil tank under the sidewalk on Maple Street that will also have to come out, but that the Michigan Economic Development Corporation has given them permission to use part of an EPA grant to get that done. The council asked the city manager to go ahead and get bids on demolishing the building.